Four interaction processing and reporting entities determine the primary call-handling characteristics of your Virtual Contact Center. 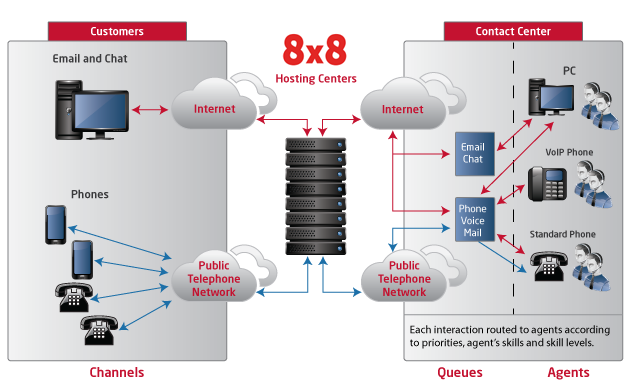 When interactions of type phone, chat, or email enterVirtual Contact Center, appropriate channels receive them, direct them to the desired queues, and finally to agents who are members of the queue. Table 1 lists the entities in the order that they process an incoming service request. Receive new service requests ("calls" or "interactions") from phone, email, or chat communications media. Specify organizational categories, such as Sales or Support, used to analyze and report upon the performance of the contact center's Channels, Queues, and Agents.